The new HTC One (M8) is a large phone, no doubt about it. Still, with those BoomSound speakers, 5-inch display, and 2600mAh battery, it's a wonder they managed to cram everything in that gorgeous, unibody metal shell. By that logic, it makes sense that the M8 makes the switch from a micro-SIM card to nano-SIM to save as much space as possible. While I can understand the need to save space, even if it's just a few millimeters, it means that if you're upgrading to the M8 from just about any other phone in the US market (including the M7), you're going to notice that your SIM card won't fit if you try to port it over. Sure, you could take your SIM into your carrier's store, and they'll likely be able to transfer your number from your micro to a nano. You could also buy one of those fancy pants SIM card cutters from eBay. But why make an unnecessary trip or spend money you don't have to when you could just do the dang thing yourself? 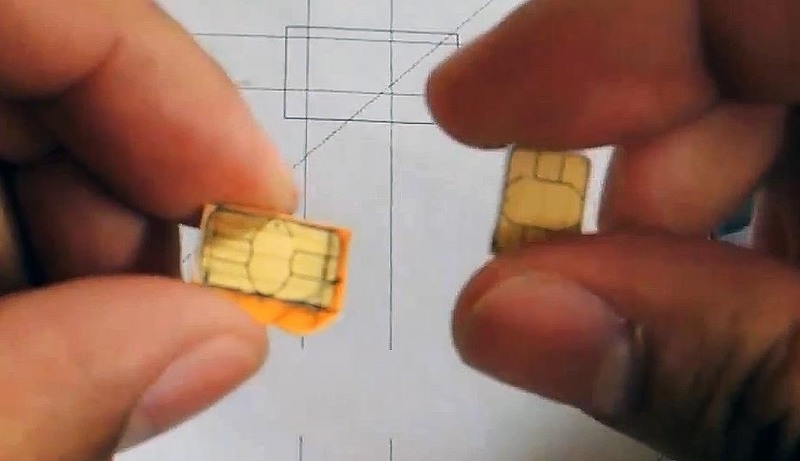 Stick around and I'll show you an easy way to convert your micro-SIM to a nano-SIM in just a couple of minutes. Disclaimer: Once you cut your card, there's no going back. Once it fits the nano-SIM form factor it won't work as a micro-SIM card anymore, meaning you won't be able to swap your card back and forth between devices that take different card sizes. 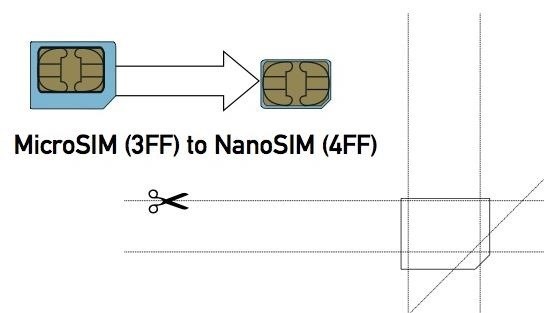 Cutting your SIM card down from micro to nano isn't difficult. If you're up for an adventure, you could even eyeball it, make some careful cuts, and fly yourself to victory by the seat of your pants. It's risky business though—you can cut down, but you certainly can't cut back up if you make a mistake, so I recommend using a template to ensure your success. Here's a good one you can use. Simply download the picture and print it out. Just make sure you're printing it in its original size, and not at a reduced or larger size. 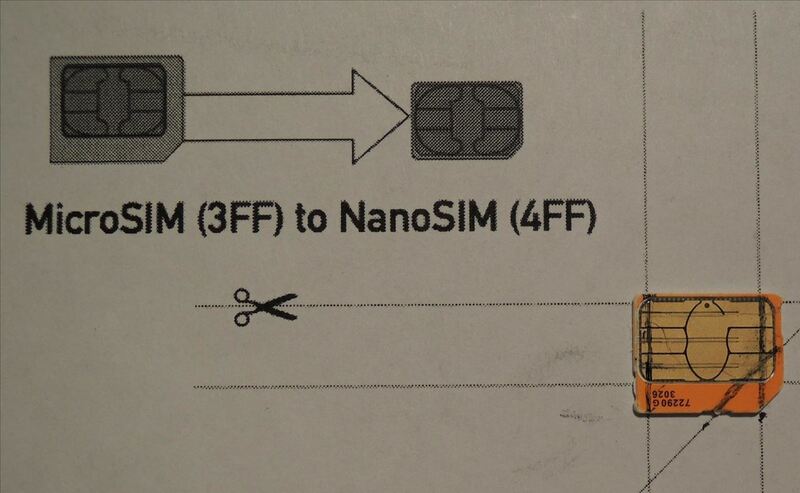 Using the bottom half of the template, we'll be going from MicroSIM (3FF) to NanoSIM (4FF). Place your SIM card down on the outline, then use a ruler to trace your cut lines with a thin marker, pen, or something that will accurately form the lines on your card. After you've gotten everything traced up, it's time to cut. I can't emphasize this enough: You cannot cut too slowly. Take your time! 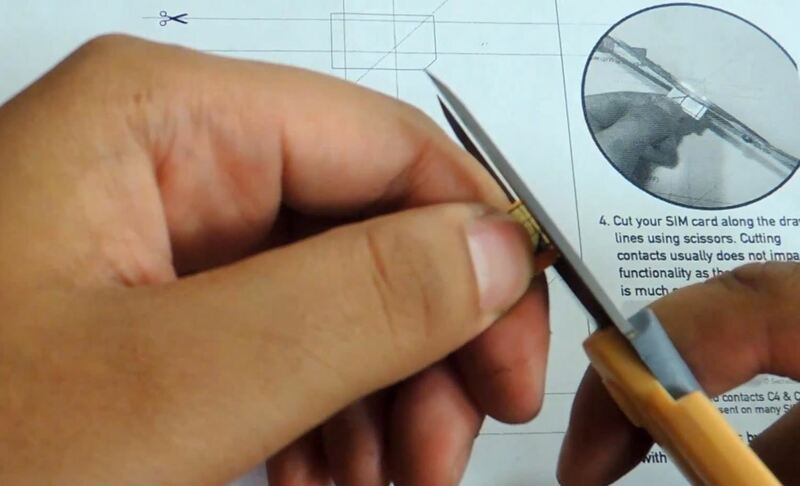 Using a sharp pair of scissors, something not too large obviously, carefully cut those lines off. Don't worry about damaging your chip—as the template points out, the actual chip is the small square in the center, so as long as you follow the lines, you'll be fine. The template suggests you use sandpaper to smooth off the edges, but as long as your newly cut SIM card fits in the SIM tray of your M8, it's all good. If the edges seem rough, you can use your fingernail to smooth them over if you don't have sandpaper lying around. And that's it, you're all done! Tell us about your results in the comments, and stay tuned for more coverage of the new HTC One M8. News: Could This Be the New Samsung Galaxy S6? Thank you for the useful information. Really appreciate it. I see you cut the gold part in the sim, if I do this will the sim still work? Does the thickness have any effect? The nano sim is less thick than the micro sim? Will the cut down micro sim fit in the M8 then? I have cut down my micro SIM and it has worked fine, regardless of its thickness. I had to sand the plastic side of mine down before it was thin enough to go in the tray right. Not sure if this is because it was originally a full sized SIM that I had cut down to micro a couple of years ago. how can I put a Dragon city hack < unlimited gems, money & food> on my HTC One, M8?. Any help will be sincerely & gratefully appreciated. Thank you for your instructions. I needed to cut a micro to a nano, it was easy and worked just fine. TIP: instead of printing your guide I right clicked guide image, copied and pasted into Paint. In Paint I went to file, print, page setup. Under scaling select adjust to 100%. It prints out perfect to scale. I compared it to the template-- printed just to see if there was a difference and yes there is; PAINT was exact whereas printing directly from template shortened the length a tad. Worked on my Moto X Pure! My phone had a nano, my wifes new phone needed a nano. I just tranced my Nano on her Micro and used scissors. Stayed careful, not to cut the metal circuitry. Tried to put into the SIM tray. Wherever it did not fit, i filed it down from that side and ultimately, it worked!!! Worked like a charm. Took just about 2m to make the perfect cuts and it fits snug. I would never have suspected that simple cropping the size of the plastic on a SIM card would make the difference in compatibility between micro and nano. Thanks for the instructions and building the DIY confidence! It's XMas day, and performing this operation certainly beats waiting 5 days for a free replacement SIM card from Verizon. Tip: You can cut liberally and slice the metal of the card, just make sure to just clip the edges and not down the middle (obviously). The functional aspect of the SIM card is a tiny chip in the center. As long as the gold colored metal can conduct from the edges to the center, it will work fine. Christmas Eve Santa Claus wanted to upgrade my wife from a Nexus 5 to a Nexus 5X, only to find the SIM card was too big! Google brought him here, and that jolly old elf took scissors and a file and trimmed that card down freehand like some kind of old school Unix SysAdmin. Christmas was Saved, thanks to you!! Excellent Guide! Thanks! Turned Micro to Nano for my IPhone 6s!